Visible Ink Press : This Aquaman-like superhero vacillated between helping humanity and being a villain who attacked humanity, seeking vengeance for the destruction of Atlantis. This Aquaman-like superhero vacillated between helping humanity and being a villain who attacked humanity, seeking vengeance for the destruction of Atlantis. He is the son of Arctic explorer Leonard McKenzie and a princess of Atlantis. He fought Nazis during World War II, becoming a friend to Americans. The creation of Bill Everett, he appeared in Marvel Comics #1 in 1939. In the 1980s, he appeared in Fantatic Four comics as a villain. Bill Everett's Sub-Mariner was the first of Timely/Marvel Comics' "big three" superheroes to be created, back in early 1939, and proved to be one of the company's most enduring characters, as well as being the first anti-hero in comics. The Sub-Mariner was dreamed up by Everett for a promotional comic called Motion Picture Funnies Weekly, packaged by Funnies Inc.--the art studio of which he was co-owner and art director. The project was not a success; only eight copies are known to exist, suggesting that few copies were ever circulated to the general public. However, later that year, when Funnies Inc. was contracted by pulp publisher Martin Goodman to package a comic, Everett recycled his original Sub-Mariner story, adding a short origin sequence, and so Marvel Comics #1 was born, hitting the newsstands in October 1939. The comic, co-starring the Human Torch, the Angel, and Ka-Zar (the latter two have no relation to their later namesakes), was retitled Marvel Mystery Comics with its second issue, and soon became one of the nascent industry's best-selling books. At the time of the Sub-Mariner's creation in April 1939, the only costumed superhero on the stands was Superman, making Everett's character genuinely groundbreaking. The Sub-Mariner's brief origin relates how explorer Leonard McKenzie leads a scientific expedition to the Antarctic, and during exploratory explosions on the ice shelf, he accidentally damages an undersea kingdom. The settlement (later christened Atlantis, inevitably) sends up one of its blue-skinned inhabitants, Princess Fen, to bargain with the men. She ends up having an affair with McKenzie, who nevertheless carries on with his dangerous experiments, killing most of the kingdom's inhabitants in the process (albeit unwittingly, it seems). It takes the Atlanteans twenty years to rebuild their numbers, but by 1939--led by the product of the union between McKenzie and Fen, Prince Namor the Sub-Mariner--they are ready to unleash their wrath on the unsuspecting surface-dwellers. The half-human Namor was pale-skinned and sported winged feet, pointed ears, and a somewhat triangular head. He possessed extraordinary speed and strength (swimming 60 miles per hour and lifting 75 tons underwater) and could even fly out of water; however, he weakened after several hours of not being wet and needed to immerse himself at least once a week. In his earliest Marvel Mystery tales, the Sub-Mariner was to prove a menace to humankind in general, rampaging through cities and striking terror into American hearts (indeed the name Namor means "avenging son"), but he soon turned his attention elsewhere. In Spring 1941, he was given his own comic, in which the Nazis rashly attacked Atlantis, and for the rest of World War II Namor was to prove their nemesis, at least in those stories in which he was not pummeling his erstwhile co-star, the Human Torch. As the war progressed, he began to star in other Timely titles, including USA, Daring, All Winners, The Human Torch, and All Select, but by this point Everett was long gone, having been drafted in early 1942. Everett was a skilled, fluid artist with a genuine love of the sea, and though his successors (including Carl Pfeufer and Syd Shores) did not share that same enthusiasm, the strip thrived in his absence. The postwar Sub-Mariner was an altogether tamer beast; since having defeated the Axis hordes, he seemed to regard himself as a de facto American, helping the police and hanging out with the beautiful Betty Dean, while rarely returning to Atlantis. As sales began to decline, the company introduced his shapely cousin, Namora, as a sort of companion-in-arms (first appearing in Marvel Mystery #82 in 1947) and she was soon spun off into her own short-lived comic. More importantly, Everett returned to the strip that year a much improved artist, but even he could not halt the industry-wide slump, and by mid-1949, both Marvel Mystery and Sub-Mariner were canceled. By late 1953, Marvel (now known as Atlas) decided to try out the superhero genre once more, and following a couple of issues of Young Men, all three of the company's principal heroes were given their own comics again. Whereas Captain America and the Human Torch proved to be short-lived, a proposed Sub-Mariner television series (which never materialized) persuaded Martin Goodman to keep Namor's title afloat for ten issues. With Everett (and Namora) back on board, it was as if nothing had changed, and all of the 1950s Sub-Mariner yarns are a joy, particularly since Everett had improved still more, marrying a winningly cartoony touch with delicate, detailed renderings. There was also less of the rampant commie-bashing prevalent in the other revivals. Barely a year after the final issue of the series (#42, 1955), DC Comics brought out Showcase #4, starring the Flash, meaning that Marvel only just missed out on starting the big superhero revival of the Silver Age (1956-1969). As it was, readers had to wait until 1962 to enjoy the Sub-Mariner again. The action in Fantastic Four #4 opens with the latter-day Torch (in his unrelated Johnny Storm version) burning the stubble off a Bowery bum and discovering the Sub-Mariner underneath. In a piece of retro-fitting from later in the decade, it was revealed that a character called Destiny had destroyed most of Atlantis and that Namor had just survived, but he was stricken with amnesia. When his memory was restored, the newly angry Subby went on the rampage, swearing revenge on humankind--much as he had done in his early days. For the next couple of years, he was a regular (unwelcome) guest in the pages of Fantastic Four (where he developed a crush on the Invisible Girl) and popped up all over the Marvel universe. After a particularly memorable rampage through New York City, in Daredevil #7, it became obvious to Marvel that Sub-Mariner was too strong a character to be wasted on occasional guest shots, and he was finally given his own series again. Namor's new berth was Tales to Astonish. In issue #70 (1965) he ousted the moribund Giant-Man strip, and under the guidance of writer Stan Lee and artist Gene Colan, it was a handsome feature. 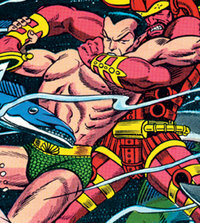 As in the 1940s, the company found it hard to sustain a strip centered on an outright villain, and so the feature concentrated on Namor's regal side in Atlantis. It introduced a supporting cast of love interest Lady Dorma; the steadfast, bearded vizier Vashti; and the plotting warlord Krang. Within a few issues, Namor had graduated from prince to king. In 1967, Bill Everett once again (temporarily) returned to his favorite son, though his hard-living lifestyle had taken its toll, and critics generally agree he was not at his best. Nevertheless, a year later the Sub-Mariner was promoted to his own title and began a successful run of more than seventy issues. The new title introduced a new creative team--Roy Thomas (on scripts) and John Buscema (on art for the first year)--and a dynamic new approach. Indeed, the early issues were almost underwater sword-and-sorcery stories. The comic soon settled down to a more traditional superhero look and introduced a succession of fishy villains, including Tiger Shark, Stingray, Commander Kraken, and Orka the Human Killer Whale, in addition to Marvel's all-purpose underwater thug, Attuma. The 1970s fully re-established the Sub-Mariner at the heart of the company, and he also starred in The Defenders, The Invaders, and Supervillain Team-up. In his own comic he suffered a number of tragedies, including the death of Lady Dorma, the loss of his throne, and the departure of Thomas (after four years). On the plus side, he tracked down his long-lost father (last seen in Marvel Comics #1) and was reunited with his (other) creator, Bill Everett, one last time. By 1972, Everett had conquered his personal demons and was once again at his quirky, intricate best, and he immediately introduced a new element into the strip in the form of the perky, teenage Namorita, daughter of the long-forgotten (and now regrettably deceased) Namora. Everett's tenure was to be brief (from #50 to #61), and he died four pages into a new episode. By the decade's end, all the Sub-Mariner's various titles either had been canceled or (in the case of The Defenders) had written him out of their lineup. The 1980s were an even less promising era for Subby, reducing the character to the status of "villain of the issue" in scattered Fantastic Four numbers; why the public had tired of him remains something of a mystery. A new decade brought an old fan--industry favorite John Byrne--a new comic called Namor (sixty-two issues between 1990 and 1995), and a move in a darker direction. Much like Aquaman, his DC Comics counterpart, Namor became caught up in the trend toward darker, harsher heroes, and he grew his hair long and sported a beard (never a good sign in comics). A revival of his romance with the Invisible Girl (now Invisible Woman) went nowhere, but he did gain a son along the way, courtesy of the previously villainous Llyra. The same year that the Namor comic was initiated also saw the birth of a new superteam, the New Warriors, starring Namorita. The New Warriors was a far more lighthearted venture and, against the perceived wisdom of the day, proved more popular than Namor's supposedly more cutting-edge nihilism. By the start of the new century, both Namor and Namorita were homeless once more, although Namor has starred in comics series launched in 2007, 2008, and 2010, and made prominent guest appearances in many others in recent years. He was also recently revealed to be a member of the Illuminati, a small council of superheroes (also including Captain America, Doctor Strange, Iron Man, Medusa, Mr. Fantastic, and Professor X) who deal with major threats to Earth. Namorita was killed in the explosion that led to the Marvel superheroes' Civil War (2006-2007), but thanks to a time paradox, has returned to life in the present. Even her mother Namora, long thought to be dead, has turned up alive and is now a member of the superhero team called the Agents of Atlas.